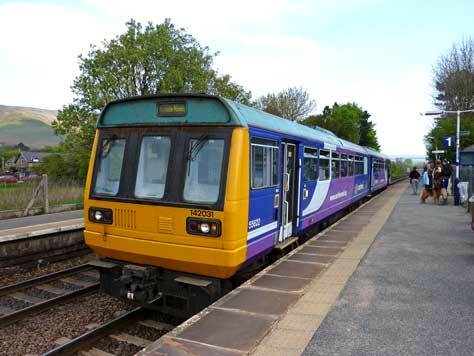 Once again, a friend and I decided to head into Derbyshire this Easter Monday, making use of the normal daytime Monday service being operated by the trains and the special Sunday timetables being operated by the buses. Owing to the problem last year, where we missed a planned connection and ran so late (when TM Travel provided a 23-seat Optare Solo on what must surely have been recognised as a very busy Peak District-bound journey from Sheffield) that we missed Plan B, C and D's connections. This year I was determined to stay away from similar 'honeypot' bus journeys. The day commenced in Grantham where our 0845 East Midlands Trains Class 158 arrived from Boston. Normally, this would have been the first departure of the day from Skegness, but with engineering work taking place between there and Boston, replacement buses deputised. The train was very lightly loaded indeed. 158777 worked the service and we arrived punctually in Nottingham at 0920, quite by chance being aboard the second-shortest journey between these two points of the day (35 minutes - only the 2005 beats this, taking 32 mins). Similar to last year, we both purchased a Derbyshire Wayfarer ticket, offering unlimited travel on the entire county's bus and train network, plus extensions to/from neighbouring towns and cities. A special version of this rover ticket is available from Beeston and Nottingham, which comes at an increased price: £14.80, compared with £8.90 for the main version. Had I planned ahead, I considered pre-purchasing a scratch-off version of the Derbyshire Wayfarer and then simply buying a cheap return ticket for the journey from Nottingham to the first station in Derbyshire through which my train passed, but Langley Mill (the station in question for today's itinerary) only offers an Anytime Return fare of £6, which, when added to the standard Derbyshire Wayfarer fare of £8.90, is 10p more than the Nottingham/Beeston supplement. And to be fair, everything went to plan. 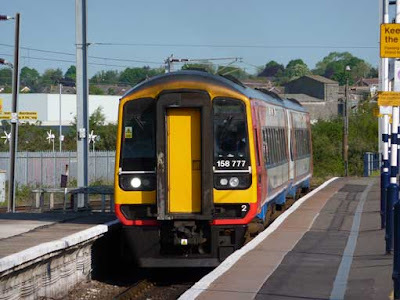 We boarded the Northern Class 158 that was awaiting departure on Platform 1 at 1015 and headed north-west into Derbyshire. From memory, the ability to travel regularly aboard a direct service between Nottingham and Leeds is relatively new, with this Northern service only starting around 2 years ago. How many actually wanted Leeds is not known to me but as with the first train in from Grantham, the patronage was very sparse! We called additionally at Langley Mill, Alfreton, Chesterfield and Dronfield before arriving at Sheffield, as advertised, at 1115. We had 59 minutes to kill before our next train at 1214 to Edale, so headed into the city centre to see what was open. Replacement tram services were being operated by Stagecoach in Sheffield (the addition of the word 'in' on its bus fleet has recently been made to the fleet name) and Supertram maintenance cars blocked the tram tracks where work was clearly being made near the Ponds Forge/Fitzalan Square stop. Back to Sheffield for our next train and Pacer 142031 arrived with a Manchester crew and we departed from Platform 8 on time. I always enjoy passing through the Totley Tunnel - the second longest mainline tunnel in the UK (recently knocked off its perch by the Stratford-St. Pancras tunnel, through which HS1 passes). But the real joy for me is the change of scenery. You leave the industrial scenery of Sheffield and emerge a few minutes later in the heart of the Peak District National Park. 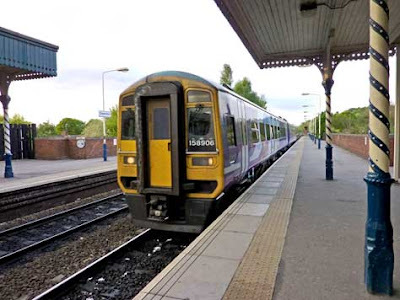 Our train was a stopping service to Manchester, taking up to double the travelling time of the non-stop services provided by TransPennine Express and East Midlands Trains. We alighted at Edale, which is the station most off-the-beaten-track. 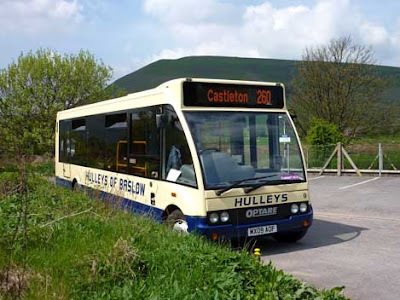 On a normal Monday, you'd probably don your walking boots and go discovering mountains, but with today being a bank holiday, Sunday timetables were in operation on the county's buses and a special Sunday-only service, operated by Hulleys of Baslow, runs between Edale and Castleton. 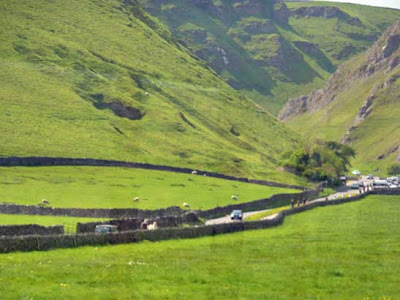 Service 260 has been running for decades and offers a very picturesque view as the bus climbs out of the valley, passing through a gap in the mountains at Mam Tor - the mountain that closed the A625 Sheffield-Manchester road in 1979, following persistent land slides forcing authorities to cut their losses and abandon the route. The only route into Castleton from the west is the minor road known as the Winnats Pass. Buses, coaches and any vehicle in excess of 7.5 tonnes are prohibited from this meandering route, however Service 260 has permission. The following video is of the Hulleys driver navigating his vehicle down the pass, towards Castleton. A niggle about the deployment of an Optare Solo on this run is that there is no back window through which to gaze, and as we ascended out of the valley in which Edale sits, the view is spectacular but not visible. The route makes two diversions along its length - the first to the Blue John Cavern and the second to Speedwell Cavern. 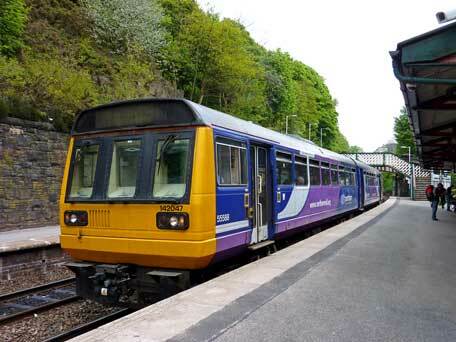 Only we boarded the vehicle at Edale Station on its 1310 departure and two more joined at Blue John Cavern, though they alighted at Speedwell Cavern. The return journey from Castleton at 1340 was better patronised, though I don't think many people paid, judging by the average age. Additionally, the driver then has to make an immediate left turn which is almost as tight as Bridge Street itself. Stagecoach East Midland used to operate Alexander PS-bodied Volvo B10Ms on this route a number of years ago, when they operated the evening service, and with the rear overhang those vehicles have, an Alexander ALX400-bodied Volvo B7TL would be child's play! Still, there's not much room for error. We travelled back to Brough and then east along the A625 through Bamford to Hathersage, where we bailed out and headed back to the village train station. Having passed through Hathersage by both bus and train on countless occasions, I've never alighted nor boarded any mode of transport here. The station is to the south of the village and is a very pleasant walk. 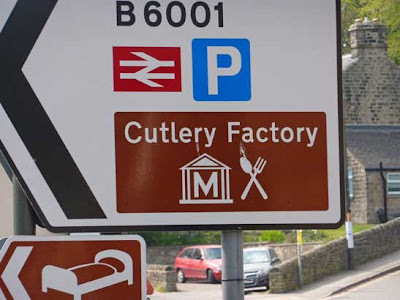 Curiously, we passed near to what must be unique in the UK - a museum devoted to cutlery. Our train was the 1432 Northern service to Manchester Piccadilly, though we'd be alighting at New Mills Central, the last stop in Derbyshire (and the last stop where our Derbyshire Wayfarer would be valid). We retraced our steps up to Edale and then continued west through Chinley to New Mills. 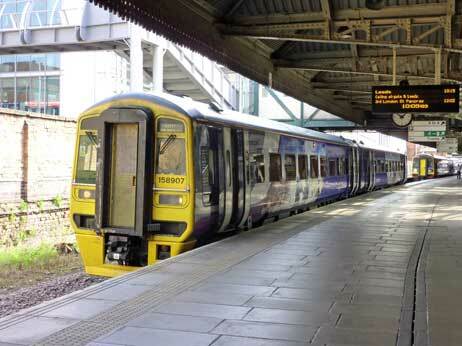 The station name New Mills Central conjours up the image of a bustling station in the centre of a busy urban location. Indeed, the fact 'Central' is needed at all implies other stations can be found in this heaving metropolis. Sadly, the small town of New Mills is nothing of the sort, although it does boast a second station and a total of three railway lines! New Mills Newtown is found on the southern side of the Goyt Valley, which the town straddles, and offers trains to either Manchester or Buxton. Pre-Beeching, it was the Midland Main Line linking London with Manchester via Monsal Dale and Bakewell. New Mills on a bank holiday is about as sleepy as it gets. That said, I very much enjoy travelling through here. Subliminally, many a Derbyshire Wayfarer itinerary has seen me pass through. Although not a million miles from Holmfirth, the town has a very strong Last of the Summer Wine feel to it and epitomises a northern town that was deeply immersed in the Industrial Revolution, with cotton being produced here until as late as just a decade ago. 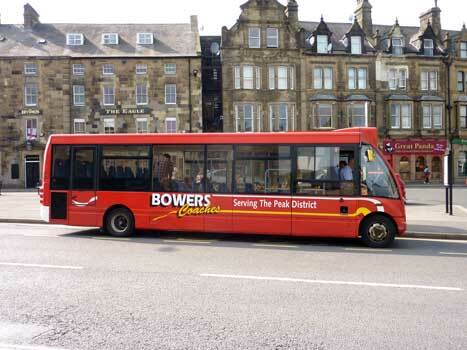 We had just over 20 minutes here before we were to depart, heading south aboard our second Optare Solo of the day, operated by Chapel-en-le-Frith-based Bowers. It was working Service 61 (Glossop-New Mills-Buxton), that offers an alternate route into its southern terminus via the much-less populated Fernilee, rather than the congested A6 trunk road. The views are excellent as the A5004 weaves around the mountain edges that board the Goyt Valley, before dropping down into Buxton. The last time we visited Buxton we headed to the water fountain in the town centre, opposite the famous Baths, to fill up a small 500ml water bottle with some infamous Buxton water. Then, we had to interrupt a lady that was filling enough bottles to keep your local branch of Tesco in business for a year. This time a chap was stood there filling up a water cooler bottle (about 18 litres), though as with the lady last year, was more than willing to stop for people who weren't taking the mick! Buxton was actually very busy indeed, despite most of the shops closing at this time. We managed to make some strategic purchases in Waitrose before catching what was to be our last bus of the day back to Chesterfield - TM Travel Service 66, worked by 1156 (LA02 WMZ), an Optare M920/Optare Solo, new to Nostalgiabus of Mitcham in 2002. A total of five of us were on board as we headed along the A6 before turning off to pass through the very dramatic Millers Dale (only made so because of the double viaduct - over which the Blue Pullman once passed - and through Litton, Tideswell, Eyam and Stoney Middleton to what was our first bottleneck of the day - Baslow. It was only volume of traffic and nothing more serious, and once east of here, we headed unhindered into Chesterfield, arriving as advertised at 1738. We made our way to the train station just in time to witness a raucous bunch of youths board a Sheffield-bound train (there'd been a football match) but witnessed some congestion for southbound services with our second bottlneck of the day unfolding before our very eyes. 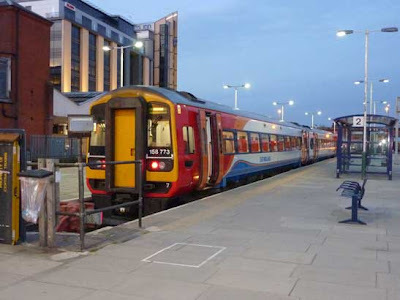 A Plymouth-bound CrossCountry Voyager occupied the new Platform 3 and a London-bound East Midlands Trains Merdian was on Platform 2. The XC service hadn't moved in over an hour. It transpired a failed freight train was causing the problem and a number of northbound services had been cancelled as a result. Everything wanting to travel in the Up direction was held at a red signal. This EMT service destined for London St. Pancras was but one! Services didn't resume until about 1845, when the XC service left, though altered its destination to Birmingham, and those wanting to travel beyond had to disembark. A later XC service would operate to Plymouth and take those displaced passengers. A very flustered but unintentionally jovial female platform dispatcher earned her money during the melee, it had to be said. After the EMT service had gone, there was a steady stream of trains arriving: a second XC for Plymouth, a second EMT for London and one for Norwich, which we were going to board, but it was packed, so opted for a Northern service that would terminate at Nottingham and were right to do so as not only did it depart on time (1901), it was practically empty. As we headed out of Derbyshire and into the neighbouring county, I looked at connection times for trains to Grantham and considered a quick trip on the Nottingham Express Transit (NET). Boasting one of the country's most modern tram networks, my travelling companion had never set foot on one of their Derby-built Bombardier units before. Our arrival in Nottingham was at 1938 and our EMT to Grantham would depart at 2051. Would there be time? I'd not got a NET timetable with me and the Internet connection on my phone was not reliable enough to start downloading pdfs, so there would be nothing for it but a walk to the Station Street terminus (soon-to-be through station when Phase 2 opens). As luck should have it a tram arrived just as we did and I was comforted to see it was travelling to Phoenix Park - the shortest distance terminus on offer. Perhaps a return trip would be possible? Timetable information for the NET has always been formidable. I have (I believe) every single version of the NET network timetable ever produced, with the current edition not having been updated since I last visited. Real attention to detail has always been made when designing the to-scale map, produced in such detail that it opens out to about five times the width of the timetable itself. Similar to the Supertram timetable produced by SYPTE in Sheffield, the main body of the timetable reads like that for a bus and I could soon spot (by picking up a timetable from inside the tram) that a trip to Phoenix Park and back would take just under 1 hour. There are a plethora of ticket options for travellers in Nottingham to make use of and the NET timetable (actually more of a tram guide) details them all. We needed to purchase a Day Ticket, costing oh-so-annoyingly a shade less than the cost of two singles, at £3. 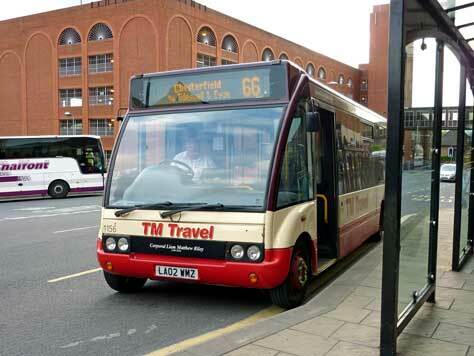 For an extra 20p users could avail themselves of the city's council-owned bus services, too. Exceptional value. 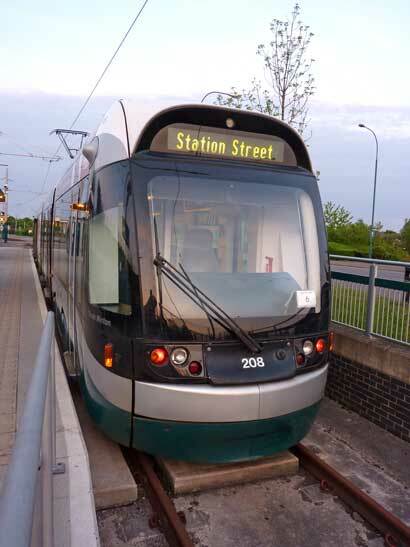 Easter Monday evening in Nottingham was pretty quiet and the tram didn't get very busy at all. This is just as well as the interior design of these trams is quite possibly the worst in the UK. 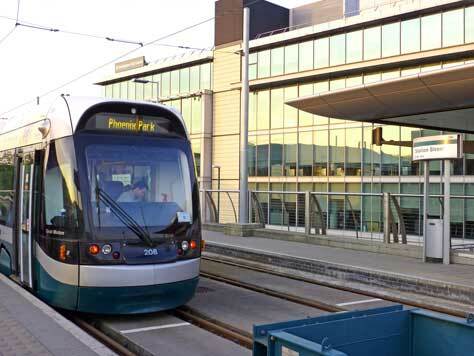 I've ridden all the networks and my favourite is the Midland Metro, followed closely by Supertram. Sadly the NET design is cramped with very few 2+2. Even the 1+2 are uncomfortable as the floor raises to the outer shell of the saloon at a 45-degree angle, meaning one leg sits a lot higher than the other. They do look very sleek and cosmopolitan from the outside, though - not dissimilar in appearance to those running around Nice. Our tram was 208, named Dinah Minton. Having ensured my friend had managed to 'tick another transport-related box', we were back at Station Street and went down the stairs to the main station below. Engineering work on the Skegness Branch (as detailed in recent LEYTR Magazines) meant that trains were terminating at Boston. Our 2051 East Midlands Trains service was Skegness-bound (others to Grantham continue to Norwich) and we had a very pleasant ride to Margaret Thatcher's place of birth in an almost-desserted Class 158, which called at a few more stops than the one this morning, and we arrived into Grantham's bay platform (3) punctually at 2132. Nottingham's bay Platform 2 is often where Skegness-bound departures leave from. Owing to a Network Rail possession east of Boston, this is where 158773 would termiate this evening. 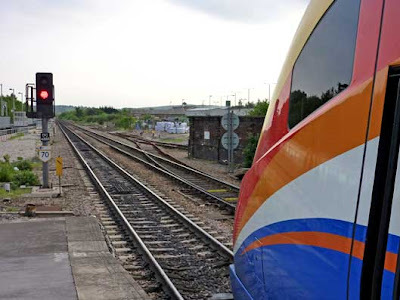 The East Midlands Trains livery - irrespective of the train type it was applied to - was in outstanding condition today. Another excellent day's travelling both to/from Derbyshire and within it. 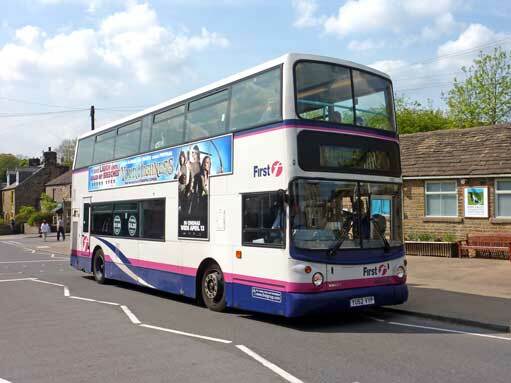 Derbyshire continues to lead the UK in their public transport provision, from the production of high-quality and detailed publications, to bus stop timetable information and subsidised services on Sundays and public holidays. Their management of the Derbyshire Wayfarer should not go without praise, too. Excluding the PTEs, there aren't many counties that offer a ticket that is valid on any bus or train. True integration and competatively priced. And of course this is nothing new, for the Derbyshire Wayfarer has been available since the end of 1984.